Access all your digital assets from one interface. Most marketing departments store digital assets in many places – individual desktops, network file server, or a CMS. Increasingly, marketers access images, videos, and documents via cloud-based storage systems shared with colleagues or external agencies and freelancers. Searching multiple repositories with different interfaces is confusing and a big time waster. Evoq Content integrates with major cloud-based storage systems and centralizes access to all your digital content, wherever it lives, in a single interface. Take charge of your digital assets with Evoq. Evoq connects to Box, DropBox, Amazon S3, Sharepoint, and Azure Storage, giving you direct access to all your digital assets without having to move files around. It’s also more convenient for external agencies and content producers share finished work via a common cloud repository. 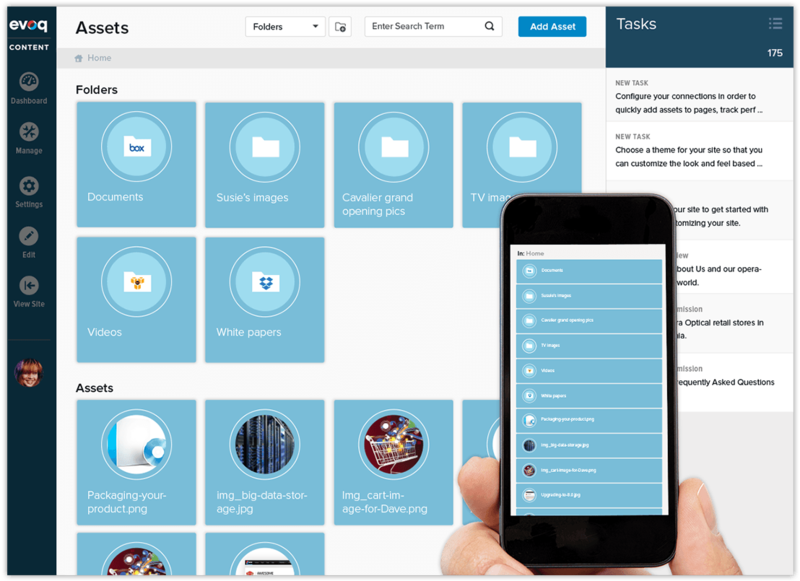 Enjoy the same user experience, workflow, and version control properties across every digital asset repository – desktop, Evoq CMS, network file server, cloud storage systems. A gallery-style interface makes it easy to organize, sort, and browse hundreds or thousands of assets across multiple repositories. Subscribe to updates and get notified any time a file or folder is added or changed, in any connected repository. Evoq’s site search also crawls connected cloud storage systems to return more useful search results for your visitors. Better management of digital assets improves your bottom line. Did someone accidentally post an old pricing sheet or the wrong product image? Avoid these mistakes that can cause customer confusion and cart abandonment, and cost your company sales and revenue. Ensure the accuracy of digital assets. Photos of your management team will change, legal contracts will be revised, and how-to videos will get makeovers. Avoid the embarrassment or complications that arise when outdated assets are live on your site. End time-wasting searches and increase productivity. A 2012 study found creative professionals spend 1 out of every 10 hours on file management. Eliminate hours of unproductive searching on servers, devices, and emails and drive your users to a single, authoritative digital asset repository. Enforce content standards and quality. As your business grows, so will your inventory of digital assets and the number of people managing them. Keep it all on track with approval workflows that will ensure the integrity and quality of your digital asset library.